I have completed my week-long drawing workshop at the Bay Area Classical Artist Atelier. You can see the progression of my drawing and my posts about the week starting last Tuesday. I finished my week-long drawing with an hour to spare, time I spent fiddling around and making small adjustments, which is always the fun part. I am really happy with it, even though I am more aware now than ever of what I need to do to learn more. I really enjoyed the workshop. I think because so few people study this way, there is a real camaraderie. People have been sharing drawing tools, offering advice and being generally supportive all week. By the end, we were all exchanging email addresses and planning when we might see each other again at future workshops. 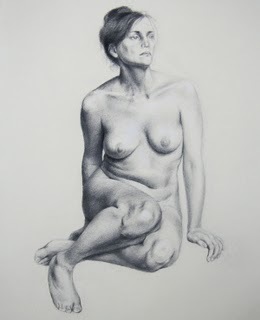 Juliette was a great teacher, her approach for executing a drawing is a method I have never been taught before. My drawing has some proportional errors still, but it is by far the most proportionally accurate figure I have ever drawn in my life. And I feel like I have new tools to apply to every drawing I do, whether in this highly detailed manner or a looser style. this is wonderful, Bravo !!! Will we see it at Feast Bay? Yes, Nik, I'll be bringing it to next FeastBay!